What Happens at a CIM Users Group Meeting? 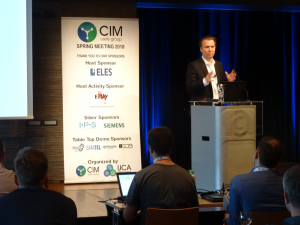 The CIM Users Group (CIMug) European Spring 2018 Meeting took place June 7-8, where over 100 attendees gathered in Ljubljana, Slovenia for the biannual event. The meeting’s theme was “Using CIM for DSO/TSO Integration and Information Exchange” – a hot topic in Europe due to the extensible use of CIM standards in ENTSO-E to meet new EU Network Codes for information exchange. The CIM is the backbone of ENTSO-E’s Common Grid Model Exchange Standard (CGMES), and is currently being implemented in more than 44 countries for TSO-TSO and TSO-DSO interconnections to ensure interoperability among various vendor-supplied computer systems. 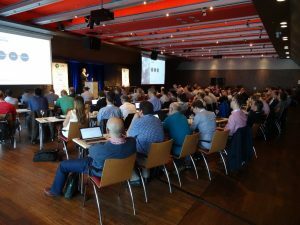 Xtensible has played a crucial role in the development of these standards over the years, both as conveners for two of the key CIM working groups (IEC TC57 WG13 and WG14) and as technical experts within these working groups. Xtensible is a major contributor to the success of the CIM Users Group, first as a founding member in 2005, then later involved in roles as Utility Co-Chair, a vendor table sponsor, and presenters at each meeting to share utility case stories as well as new developments in the application of the CIM. Xtensible’s participation is an effective way to achieve the vision of turning CIM standards into solutions for solving the most important electric utility information exchange challenges. Attending a CIM Users Group meeting is one of the best ways to learn how CIM is being used. This forum is a vital resource for those looking to understand CIM, and offers opportunities to network with other utilities and vendors that have already implemented CIM-based solutions. CIM University conducts three parallel tracks presented by experienced staff, covering everything from introduction and overview of CIM to in-depth tutorials on how CIM is used for system integration, power system model network analysis and model exchange. Meetings feature keynote speakers, utility case stories, new developments changing the CIM landscape, and presentations from vendor and utility meeting sponsors. Meetings are held twice each year; the Spring meeting occurs in Europe and the Fall meeting in North America. The next meeting will be held at ONCOR in Dallas on October 23-25, 2018. Want to get involved? The CIM Users Group website is a great tool to receive updates on the latest meeting information. Join the online community to access a wealth of additional resources, including access to draft CIM standards. Xtensible can also help you with a variety of in-house training workshops ranging from single-day to two-week offerings, along with pilot project assistance.